With just SIX ingredients, this soup is a NO brainer! 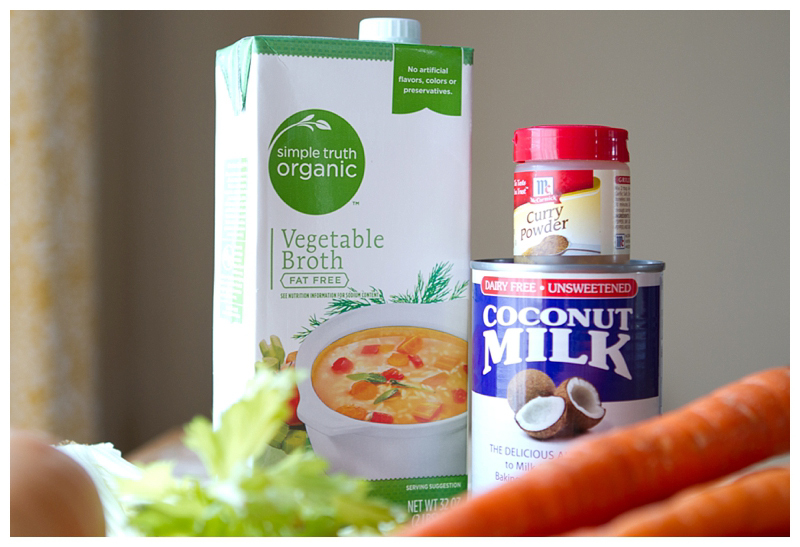 All you need is Carrots, Onion, (celery for seasoning), Veggie Broth, Curry Powder and Coconut Milk. Wham, Bam, Thank You Ma'am! I'm kinda obsessed with curry powder. This Indian spice is a mixture of coriander, turmeric, cumin, fenugreek and chili peppers. And the word curry comes from the word kari meaning 'sauce for rice.' My favorite way to use curry powder is with humus...YUM! But I thought, why not try using this spice's earthy tone to kick-up a simple carrot soup. Coconut milk is the perfect vegan balance to the chili peppers, and gives the soup a creamy texture. If you're looking for a vegan soup on a rainy day, or a unique idea for Easter - Try this recipe and let me know what you think in the comments below. Add your carrots, onion and celery to a large stock pot and cover with vegetable broth. Bring to a boil, reduce heat to simmer and cover with a tight lid for one hour. You are looking for a very tender texture on your carrots. Once carrots are soft, remove the celery and drain half of the broth (reserving in a bowl in case needed) Transfer your carrots and onion to your food processor / blender and begin to puree your carrots. You're looking for a soup consistency, so if it's too thick you may need to add some of your reserve broth. Return pureed carrots to pot over low heat and add curry powder. Open your coconut milk (making sure the can is upright / the way it was stored in your pantry). On the top, there will be a thick, white substance. That is what you are going to spoon into your pot and stir, reserving enough for garnishing each bowl. Garnish with a spoonful of coconut milk and sprinkle of curry powder and enjoy! This soup is LOADED with health benefits - like anti-oxidants, vitamins and fiber. If you've ever heard of the Hallelujah Diet, you know carrots are a staple in their philosophy for their cancer-fighting properties. I have been meat-free since January. I still remember sitting on my couch one cold afternoon watching a Netflix documentary while eating lunch. I had a heaping serving of grilled chicken on my plate while a golden beet was roasting in the oven. (I'd never tried a golden beet before and thought I'd give it a try.) Little did I know... watching one film, Food Choices by Michael Siewierski, would be the flame that ignited a major life journey. As I pushed the gristly chicken around on my plate, it turned grisly... When the golden beet was finished, I took a bite and realized it had a surprisingly satisfying, fleshy texture. I just might be able to live without meat! And I think that's the fear most people have when they hear VEGAN. 'I could give up meat, but there's no way I could give up dairy!' While I'm still adapting and weaning dairy out of my diet entirely, THE DAIRY-FREE industry has made HUUUUGGGE (in my best Trump impersonation) advancements. When I'm at home, I try to live dairy-free. One day I was craving a grilled cheese, so I went to Kroger searching for dairy-free cheese and butter. I had memories of the 90s when, for some reason, I tried dairy-free cheese that tasted like flavored cardboard. Without doing any research, I randomly selected a cheese and butter. I picked-up my usual Ezekiel Bread, hummus and veggies and headed home to see just what dairy-free cheese tastes like... You Guys... It is AMAZING!!!! And I'm not just saying that because it's been months since I've had cheese, like I said I will indulge in pizza. No, this stuff is awesome because it's awesome! It tastes JUST LIKE CHEDDAR CHEESE!! Since making this recipe, I've gone on to make dairy-free lasagna that my kids and husband LOVE! (I'm still struggling with vegan egg substitutes, but I've got the cheese-thing down.) So, if you are thinking about cutting dairy out of your diet - or just cutting back - I highly encourage you to look at the 'alternative' aisle at your grocery store. Vegan Options have come a LONG way! Daiya cheese is AMAZING!!! Chop some of your favorite veggies. I use radish, cucumber, tomatoes and avocado. Place your hummus on your bread as a base that your veggies will stick to. Layer veggies, cheese and veggies so they'll all melt together nicely. Grille with a panini press (mine is Pampered Chef) until golden brown on each side with melted cheese. And in keeping with all-things green this week, I got inspired to create a Shamrock Smoothie recipe. I knew I wanted to use a little turmeric (which is a peppery root in the ginger family with amazing health benefits) but I wanted to balance the flavor - and color (turmeric is BRIGHT ORANGE and can actually stain your skin when peeling & chopping) - so I added kiwi for sweetness. A dash of cayenne & black peppers give the smoothie a kick. I started by soaking a tablespoon of chia seeds in water, which creates a gelatin-like texture to add creaminess to the smoothie. I peeled the turmeric root and ground in my food processor. 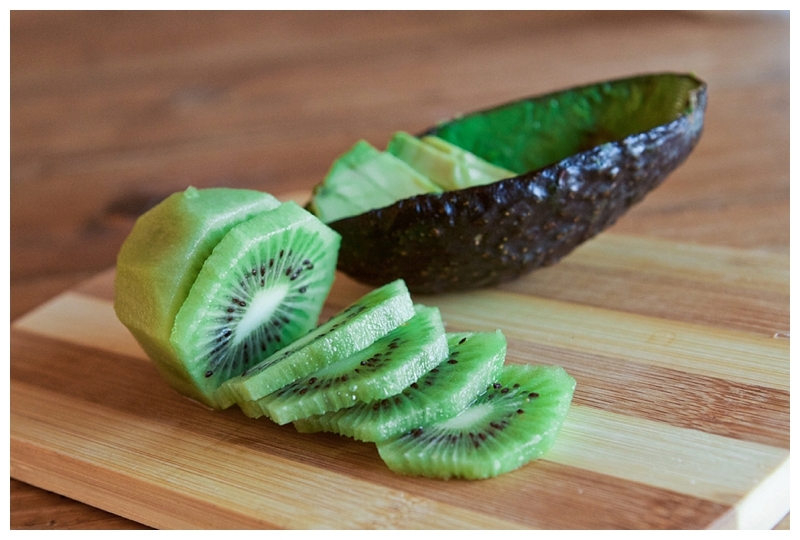 I chopped one kiwi and 1/4 an avocado. I added 2 cups of spinach (mixed greens) to my ground turmeric to chop. I sliced a banana (for added sweetness and thickness) and scooped one serving of vanilla veggie protein powder to mix with 1/8 teaspoon of black pepper and just a DASH of cayenne pepper. I added everything to my blender with 1 Cup of Water & 1 Cup of Ice and blended until smooth. It was delicious!!!! Please try it out & let me know what you think! HAPPY ST. PATTY'S DAY!!! This year I made a conscious effort to live a healthier lifestyle. This has nothing to do with getting ready for 'bikini season' (let's be honest, after having twins that ship has sailed...) No, this decision was about trying to feel better - mind, body and soul. Now, please don't think I'm up here on my soapbox... I FAIL miserably at this endeavor ALL THE TIME! Because it's hard to live a 2017 lifestyle, at a 2017 speed, without finding yourself in a McDonald's drive-thru... or Wendy's... or KFC... You get the idea. And while I was making healthier choices for myself, it took a minor health scare with one of my twins to make me realize I wasn't making healthy choices for my children. While I was eating a salad, I was letting my girls eat chicken nuggets and fries. There's nothing wrong with that in moderation, but it is a problem when your children think that's the only thing they should ever have to eat. So I've been trying to make this a family-wide, lifestyle change. And I have to say, my girls have been troopers! They don't complain about drinking water instead of juice, they actually like salad, and pretty much any vegetable is delicious when drizzled with olive oil, sprinkled with sea salt and roasted!!!! On my twins' last birthday I told them I would fix them anything they wanted for breakfast. When they requested waffles, I used it as a great opportunity to make Paleo Waffles. Now, I don't claim to be a Paleo expert by any means...but what I do know (and love) about this food lifestyle (I HATE the word diet) is that it's basic principle is that you only eat items that would have been eaten during the Paleo era (think cave men.) So no processed foods, no dairy, no sugar. It sounds terrible, right? Well, I PROMISE you it's not! Is it challenging? Yes. Does it require planning? Absolutely! Does it make you feel better? 100 PERCENT!!!! The main question you might have about how you make waffles without flour is; What do you use to replace the flour? The answer is one of the most AMAZING inventions EVER...Almond Flour. This miracle in a bag's only ingredient is blanched almonds! A serving only has 6 grams of carbohydrates (2% of the daily value), 1 gram of sugar and NO sodium! How AWESOME is that? You're probably thinking, 'I bet it tastes HORRIBLE!' It may not taste like the waffles you're use to eating, but it is still delicious! Would these faces lie? So here's the recipe! Give it a try and let me know what you think in the comments below. Combine all dry ingredients in a large bowl. Beat eggs, vanilla and honey in a smaller bowl & mix with the dry ingredients. (Note that the consistency will be a little different than you're used to because of the almond flour...Our batter looked similar to applesauce.) Plug in your waffle maker and coat with melted coconut oil (I used a marinating brush.) Pour a 1/4 cup of batter on each griddle and close the lid. Do NOT let your waffles cook the whole time your waffle maker thinks they should. The almond flour cooks quickly, so check them about half-way through the cooking cycle. Top with butter and maple syrup & ENJOY!!!! It’s OFFICIAL… The marathon is right around the corner! We’re now counting down in days instead of weeks, which is a exciting & terrifying thought! At last night’s training run I heard two common themes being discussed – 1) The weather forecast for race day 2) The fear of/avoidance of getting sick. Lucky for me (as I knock on wood), I got that out of my system over the last two weeks while I was running a 24-hour infirmary for my three, very sick, little girls. I hate to disgust you with the details… so let me just say that there were very few surfaces in my home that were not thrown-up on over the last few weeks. And while I’m usually pretty good dealing with this kind of stuff, I was in NO position to get sick myself!!!! So I’ve been a Lysol spraying, Clorox wiping, sheet washing, hand-sanitizing FREAK!!!! 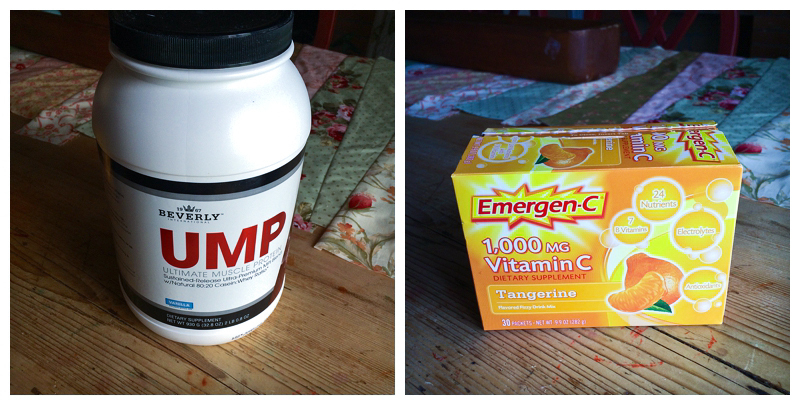 I also started drinking a vitamin C supplement I found at the grocery called Emergen-C. I usually gag at the taste of these powdery mixes, but I added it to my hot lemon and honey water in the morning and it was not too bad. But last Tuesday I came home from a training run knowing I needed to replenish my muscles with a protein shake, so I had a crazy idea to mix the two together. Mix them all together in your shake cup or blender and ENJOY! It tastes just like an Orange Creamsicle! Sign up to receive the latest blog posts, give-aways and updates.